Flow induces cytosolic Ca2+ increases ([Ca2+]i) in intact renal tubules, but the mechanism is elusive. Mechanical stimulation in general is known to promote release of nucleotides (ATP/UTP) and trigger auto- and paracrine activation of P2 receptors in renal epithelia. It was hypothesized that the flow-induced [Ca2+]i response in the renal tubule involves mechanically stimulated nucleotide release. This study investigated (1) the expression of P2 receptors in mouse medullary thick ascending limb (mTAL) using P2Y2 receptor knockout (KO) mice, (2) whether flow increases induce [Ca2+]i elevations in mTAL, and (3) whether this flow response is affected in mice that are deplete of the main purinergic receptor. [Ca2+]i was imaged in perfused mTAL with fura-2 or fluo-4. It is shown that luminal and basolateral P2Y2 receptors are the main purinergic receptor in this segment. Moreover, the data suggest presence of basolateral P2X receptors. Increases of tubular flow were imposed by promptly rising the inflow pressure, which triggered a marked increase of [Ca2+]i. This [Ca2+]i response was significantly reduced in P2Y2 receptor KO tubules (fura-2 ratio increase WT 0.44 ± 0.09 [n = 28] versus KO 0.16 ± 0.04 [n = 13]). Furthermore, the flow response was greatly inhibited with luminal and basolateral scavenging of extracellular ATP (apyrase 7.5 U/ml) or blockage of P2 receptors (suramin 300 μM). The flow response could still be elicited in the absence of extracellular Ca2+. These results strongly suggest that increase of tubular flow elevates [Ca2+]i in intact renal epithelia. This flow response is caused by release of bilateral nucleotides and subsequent activation of P2 receptors. An increase of fluid flow over the apical side of cultured renal epithelia1 or in intact renal tubules2 elicits an increase of cytosolic Ca2+ ([Ca2+]i). In cultured renal epithelium, this flow-induced [Ca2+]i response seems to depend on the presence of the primary cilium.3 The signal transduction pathways of this flow-stimulated [Ca2+]i elevation, however, is poorly understood, and the available data are conflicting.1–4 One model for the flow-induced increase in [Ca2+]i hypothesizes that application of mechanical stress/bending to the primary cilium results in conformational changes in polycystin-1 that further interacts with polycystin-2 to allow Ca2+ influx at the base of the primary cilium.4 This Ca2+ influx then induces Ca2+ release from intracellular stores. Noteworthy, mechanical stimulation of cells including epithelia in general promotes release of nucleotides (ATP, UTP).5–9 Nucleotide release occurs without apparent damage of the cells and is shown to underlie traveling waves of [Ca2+]i in cellular networks.7,10 Also MDCK cells, the renal cell line used to establish the concept of the primary cilium as mechanosensor, releases ATP after mechanical stimulation.5 The intact renal tubule and MDCK and other renal epithelial cells are known to express numerous luminal and basolateral P2 receptors.6,11 Their activation commonly triggers an increase of [Ca2+]i.12 Therefore, we hypothesized that flow-induced [Ca2+]i signals in renal epithelia involve release of nucleotides and associated signaling events. Data supporting this hypothesis are presented in this article. We suggested that an increase of tubular flow triggers nucleotide release and subsequent stimulation of epithelial P2 receptors and increase of [Ca2+]i. To test our hypothesis, we first needed to establish whether P2 receptors are functionally expressed in medullary thick ascending limb (mTAL). Generally, transporting epithelia express luminal and basolateral P2 receptors.6 Studies indicate prominent luminal expression of P2Y2 receptors in collecting duct, which inhibit electrogenic Na+ absorption.13,14 Therefore, we believed this receptor to be the prime candidate for extracellular nucleotide-mediated [Ca2+]i signaling in mTAL. If this is the case, then the P2Y2 receptor knockout (KO) mouse would be a suitable tool to investigate the functional expression of P2 receptor in mTAL. Figure 1 shows that both 100 μM luminal UTP and ATP trigger brisk increases of [Ca2+]i of similar amplitude in wild-type (WT) but never in KO tubules (fura-2 ratio increase, luminal UTP, WT 0.71 ± 0.2 [n = 5], KO 0.02 ± 0.01 [n = 6]; luminal ATP, WT 0.60 ± 0.13 [n = 5], KO 0.02 ± 0.01 [n = 6]). Other nucleotides such as UDP and ADP in the same concentration were without effect (data not shown). This strongly suggests that the P2Y2 receptor is the only P2 receptor expressed on the luminal side of mTAL. Effect of luminal UTP (100 μM; A) and ATP (100 μM; B) on [Ca2+]i in perfused mouse medullary thick ascending limb (mTAL). In wild-type (WT) tubules, both nucleotides elicited prompt and transient increases of [Ca2+]i. Mice that were deplete of the P2Y2 receptor never responded to either luminal ATP or UTP. UTP also stimulated increases of [Ca2+]i from the basolateral side (Figure 2). Again, this response was present only in tubules from WT mice (fura-2 ratio increase, basolateral UTP, WT 0.25 ± 0.06 [n = 18], KO 0.01 ± 0.01 [n = 13]). Paired experiments demonstrated that luminal UTP was more potent than basolateral UTP at increasing [Ca2+]i in WT mTAL (luminal UTP, WT 0.71 ± 0.2 [n = 5] versus basolateral UTP, WT 0.24 ± 0.06 [n = 6]; P = 0.04). Basolateral ATP was also able to stimulate [Ca2+]i increases in WT and KO tubules. The pattern of the basolateral ATP-induced [Ca2+]i increase in WT tubules, however, was significantly different from that of basolateral UTP (Figure 3). Basolateral ATP increased [Ca2+]i with an initial peak followed by a sustained [Ca2+]i plateau in the continued presence of the agonist. The [Ca2+]i plateau value measured 100 s after the basolateral nucleotide addition was significantly higher in tubules that were stimulated with ATP compared with UTP (0.19 ± 0.02 versus 0.01 ± 0.02, respectively; P = 0.001). An ATP-induced [Ca2+]i plateau was also seen in KO tubules with an amplitude similar to WT (0.26 ± 0.08 versus 0.19 ± 0.08; n = 5; P = 0.462). In contrast, the initial basolateral ATP-induced [Ca2+]i peak was significantly reduced in KO tubules (0.12 ± 0.04 versus 0.43 ± 0.12; n = 5; P = 0.03). These results show the presence of basolateral P2Y2 receptors. Furthermore, the prevailing ATP-inducible [Ca2+]i response in KO tubules unmasks other basolateral P2 receptors. The [Ca2+]i plateau was completely dependent on basolateral Ca2+ (Figure 3). This supports that basolateral ATP stimulates basolateral Ca2+ influx and suggests this to occur via a Ca2+ permeable P2X receptor. In the entire series of experiments, the resting fura-2 ratio was slightly but statistically significantly lower in WT as compared with KO tubules (WT 0.95 ± 0.03 [n = 31]; KO 1.03 ± 0.03 [n = 34]). This indicates a small elevation of resting [Ca2+]i in KO mTAL. Subsequently, we investigated the source of the UTP-stimulated [Ca2+]i elevations. Luminal and basolateral UTP (100 μM) was tested in the bilateral absence of extracellular Ca2+ (Figure 4). Under these conditions, UTP still stimulated a transient [Ca2+]i increase amounting to 0.35 ± 0.04 (n = 3) ratio units from the luminal side and 0.31 ± 0.15 (n = 3) ratio units from the basolateral side. In summary, these data strongly suggest that (1) mouse mTAL express luminal and basolateral P2Y2 receptors, which trigger an increase of [Ca2+]i via release of Ca2+ from internal stores and likely also activation of store-operated [Ca2+]i entry; (2) luminal P2Y2 receptors are significantly more potent at triggering [Ca2+]i elevations than P2Y2 receptors that are localized on the basolateral side; and (3) mTAL express an additional basolateral ATP-sensitive P2 receptor, which triggers a sustained [Ca2+]i influx and plateau. Effect of basolateral UTP (100 μM) on [Ca2+]i in perfused mouse mTAL. In WT tubules, UTP caused a prompt increase of [Ca2+]i. The basolateral UTP-induced [Ca2+]i increase was always transient, similar to that observed by addition of luminal UTP and ATP. 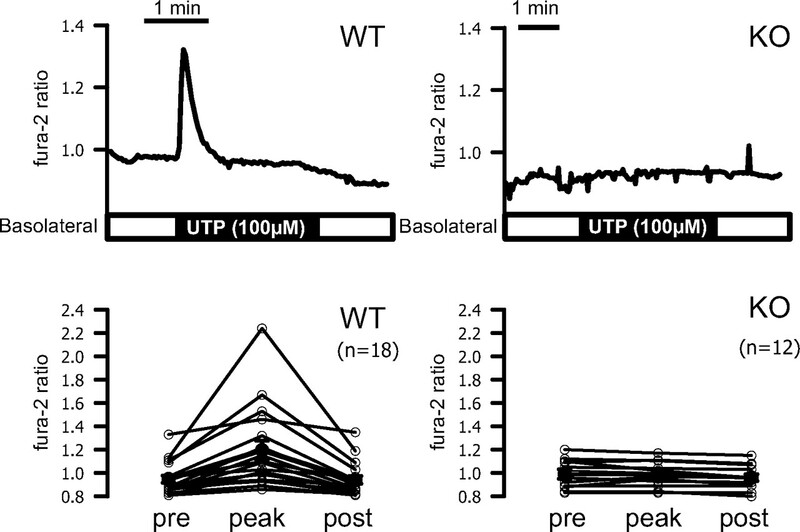 In mice that were deplete of the P2Y2 receptor, basolateral UTP never elicited a response. 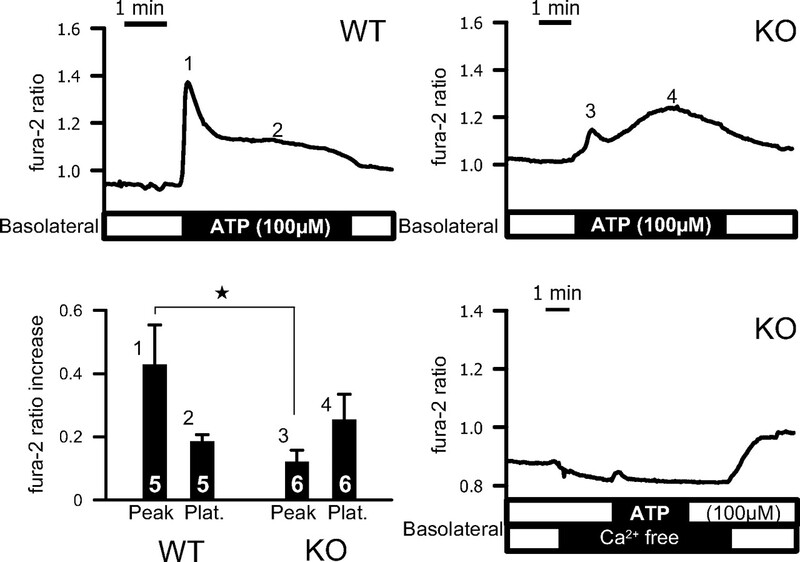 Effect of basolateral ATP (100 μM) on [Ca2+]i in perfused mouse mTAL. In WT tubules, ATP induced a prompt increase of [Ca2+]i. The basolateral ATP-induced [Ca2+]i increase consisted of an initial peak followed by sustained elevation. In P2Y2 receptor knockout (KO) mice, basolateral ATP triggered only a small initial [Ca2+]i peak followed by a sustained [Ca2+]i plateau. The left bottom panel summarizes these data (*statistical significance P < 0.05). The right bottom panel shows that the [Ca2+]i plateau is absent without basolateral Ca2+. Effect of luminal or basolateral UTP (100 μM) on [Ca2+]i in perfused mouse mTAL in the absence of extracellular, bilateral Ca2+. UTP stimulated an increase of [Ca2+]I, reflecting release from intracellular stores. Note that removal of basolateral (not luminal) Ca2+ reversibly reduced tubular resting [Ca2+]i. Next we investigated whether an increase of luminal flow is able to trigger [Ca2+]i elevations in mTAL as seen in different cultured cells (MDCK) or intact rabbit or mouse cortical collecting duct. To this end, we followed the experience of the laboratory of Satlin.2,15 After establishment of tubule perfusion, the pressure on the inflow side was reduced to 10 cmH2O for 10 min. This led to a significant reduction of the tubular lumen as visible online in the original fluorescence image of the tubule. Subsequently, the hydrostatic pressure of the inflow was abruptly elevated (within 1 s) by 80 cmH2O, leading to sudden distension of the tubule and concomitant elevation of tubular flow. Tubular distension was quantified in each tubule by measuring the area of tubular fura-2 fluorescence (pixels above threshold 345 nm). Figure 5 shows the effect of increasing inflow pressure on the tubular diameter and the corresponding [Ca2+]i signal. Below the traces 6 fura-2 ratio images show the time course of this effect. Obviously, this pressure increase instantaneously (within the first seconds) elevated mTAL [Ca2+]i in a biphasic manner with an initial peak followed by a decline of [Ca2+]i within 1 to 3 min. After 3 min, tubular inflow pressure was reduced to 30 cmH2O, resulting in a slow decline of tubular lumen. Frequently, single local [Ca2+]i elevations were observed (image 5 and 6, Figure 5). Effect of increasing the inflow perfusion pressure abruptly by 80 cmH2O on [Ca2+]i (top) and tubular geometry (middle). The numbered fura-2 ratio images in pseudo-color reflect the flow-induced elevations of [Ca2+]i. Note that after the initial flow-induced increase of [Ca2+]I, several single, confined [Ca2+]i elevations are seen in images 5 and 6. Then we studied whether this flow response was similar in P2Y2 WT and KO tubules. Figure 6 summarizes the entire series of experiments and shows that the flow response in WT tubules is a robust phenomenon and could be stimulated in nearly all tested tubules. The mean [Ca2+]i peak in WT tubules amounted to 0.44 ± 0.09 ratio units (n = 28). In clear contrast, the flow-induced increase of [Ca2+]i was greatly reduced in KO tubules (0.16 ± 0.04 ratio units; n = 13; P < 0.05). The tubular distension as measured with pixel area above threshold approach was similar in both populations (18 ± 2.1% in WT, 22 ± 3.2% in KO). The actual diameters during the flow response changed in WT from 22.7 ± 0.6 to 25.6 ± 0.5 μm and in KO and from 22.8 ± 0.7 to 26.6 ± 0.7 μm. The tubular distensions showed a significant degree of variation. In Figure 6B, we plotted the magnitude of the induced [Ca2+]i elevation as function of tubular distension for all WT and KO tubules. The data suggest that larger tubular distensions provoke bigger [Ca2+]i signals in WT but not in KO tubules. This strongly indicates that the flow response that is induced in mouse mTAL depends on the presence of P2Y2 receptors and suggests that increased flow promotes tubular release of nucleotides. Flow-induced [Ca2+]i increases in mTAL of P2Y2 WT and KO mice. (A) Note that the flow-induced [Ca2+]i increase is greatly reduced in P2Y2 receptor KO tubules. 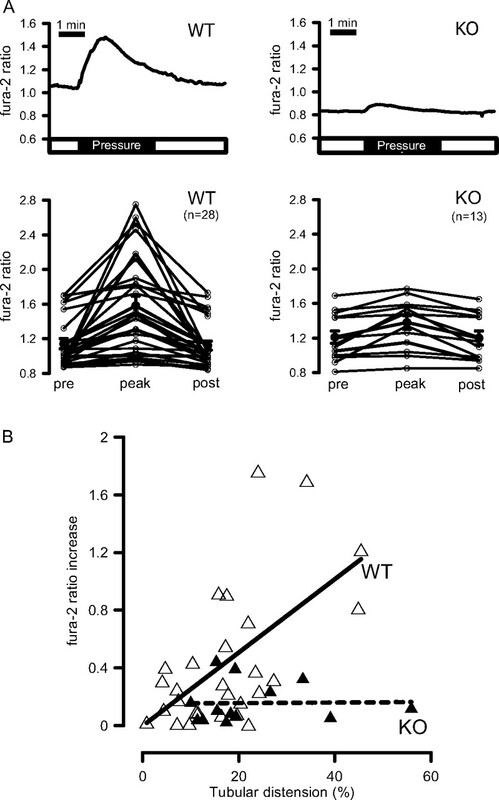 (B) All flow-induced [Ca2+]i increases as a function of the induced tubular distension in P2Y2 receptor WT and KO mice. These data suggest that an increase of the mechanical stimulus increases the resulting [Ca2+]i elevation in WT but not in KO tubules. The flow response was investigated in the absence of Ca2+ on both sides of the epithelium. Figure 7 shows an original trace from a WT tubule in Ca2+-free medium. The luminal solution was kept Ca2+-free for 30 min before the pressure increase. Two minutes before the stimulus, basolateral Ca2+ was also removed. In WT mice, the flow response in the absence of extracellular Ca2+ (0.26 ± 0.08 ratio units; n = 8) was slightly but not significantly reduced as compared with WT controls (0.44 ± 0.09 ratio units; n = 28). These results indicate that a significant part of the flow response–mediated [Ca2+]i increase can be triggered in the absence of extracellular Ca2+ and therefore must result from release of Ca2+ from internal stores. (A) Effect of increasing the inflow perfusion pressure on tubular [Ca2+]i (top) and geometry (middle) in the absence of luminal and basolateral Ca2+. 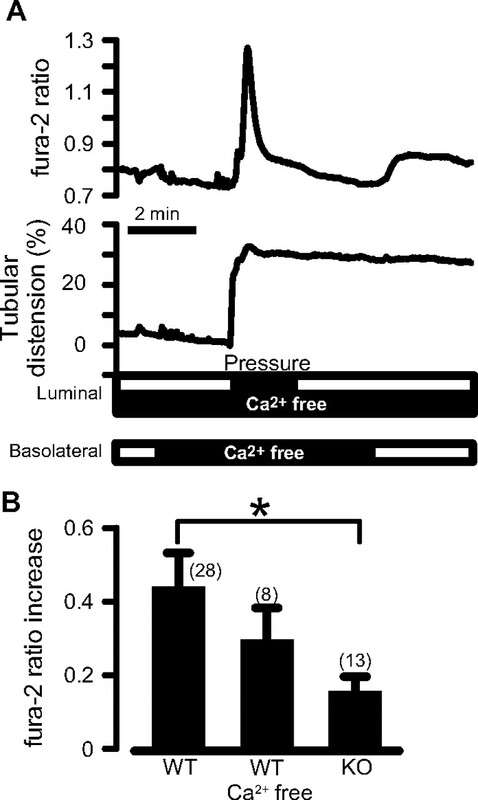 Removal of luminal Ca2+ did not affect resting [Ca2+]i. On the contrary, removal of basolateral Ca2+ always promptly and reversibly lowered [Ca2+]i. (B) Summary of the different experimental series (*statistical significance P < 0.05). The results thus far suggest that an increase of tubular flow promotes release of nucleotides from the renal tubule. Next we examined the effect of apyrase on the flow response. Apyrase is known to scavenge extracellular ATP. These experiments were performed with the non-ratiometric Ca2+ dye fluo-4. Noteworthy, 7.5 U/ml apyrase reversibly reduced resting fluo-4 fluorescence by 12.3 ± 4.7% (n = 5, P < 0.05). 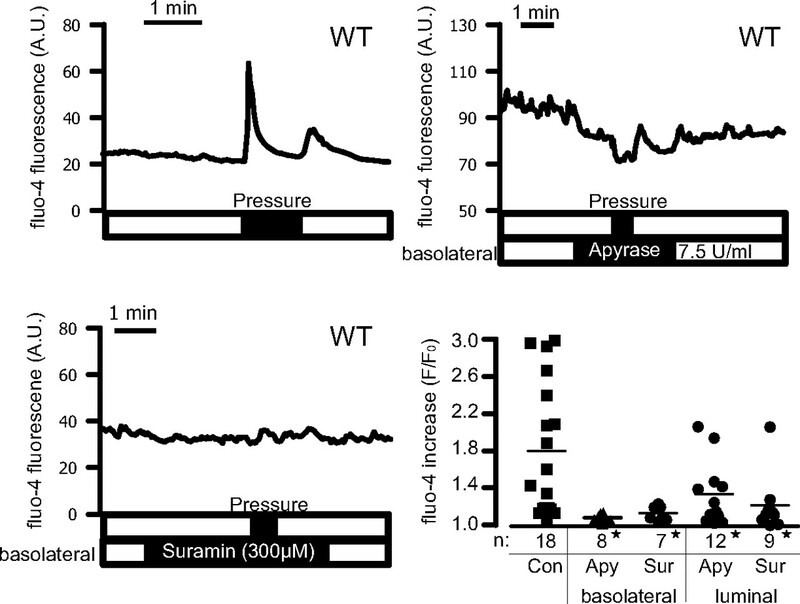 Importantly, in all experiments, basolateral apyrase led to a near-complete inhibition of the flow-induced [Ca2+]i increase as compared with the control response (F/F0 increase without apyrase 1.8 ± 0.16 [n = 18]; with basolateral apyrase 1.09 ± 0.01 [n = 8]; P < 0.05; Figure 8). We also tested basolateral suramin, a nonspecific blocker of most P2 receptors. Addition of suramin (300 μM) basolaterally 3 min before stimulation also inhibited the flow response (F/F0 increase with basolateral suramin 1.13 ± 0.03; n = 7; P < 0.05; Figure 8). Apyrase (7.5 U/ml) and suramin (300 μM) were also tested from the luminal side and were included in the luminal perfusate before starting fluo-4 AM loading. Both antagonists were present for 30 min before the stimulus was applied. Luminal apyrase and suramin inhibited the flow response (F/F0 increase with luminal apyrase 1.34 ± 0.03 [n = 12; P < 0.05]; with luminal suramin 1.22 ± 0.11 [n = 9; P < 0.05]; Figure 8). These data provide additional evidence that flow stimulation provokes bilateral ATP release from the mTAL. Effect of apyrase (7.5 U/ml) and suramin (300 μM) on flow-induced [Ca2+]i increase in mouse mTAL measured with fluo-4. Note that luminal and basolateral apyrase or suramin inhibited the response (*statistical significance P < 0.05). MDCK cells without primary cilium show no flow response,3 and intact renal tubules from orpk mice with shortened primary cilia display a reduced flow-stimulated increase of [Ca2+]i.15 We therefore investigated whether the reduced flow response in mTAL of P2Y2 KO mice coincides with reduced cilia length. The data in Figure 9 indicate that this is not the case. The length of the primary cilium was 3.8 ± 0.01 μm in WT (n = 4 mice and 22 cilia) and 3.9 ± 0.01 μm in KO tubules (n = 3 mice and 16 cilia). Figure 9 shows immunolabeling images of acetylated tubulin staining of the primary cilia from WT and KO mTAL tubules. Length of primary cilia in mTAL from P2Y2 receptor WT and KO mice. Confocal images of acetylated-tubulin–labeled mTAL showing the primary cilia on the luminal side of the tubule. The basolateral borders of the tubule are faintly visible and highlighted with a dashed line. The tubular lumen is collapsed. Length of primary cilium in WT is 3.8 ± 0.01 μm (n = 22) and in KO is 3.9 ± 0.01 μm (n = 16). The intention of this study was to investigate whether purinergic signaling is involved in the flow-induced increase of [Ca2+]i in intact renal tubules. The following mechanistic model for the flow-induced [Ca2+]i increase was suggested: Tubular flow triggers bending of the primary cilium and mechanosensory activation of the TRP channel complex polycystin-1/2. This in turn triggers Ca2+ influx via polycystin-2 over the luminal membrane to promote Ca2+-induced Ca2+ release and subsequent spread of the Ca2+ signal to neighboring cells.4,16 There are several reasons to speculate that paracrine factors are involved in the flow-induced [Ca2+]i response: (1) A flow response can be triggered in intercalated cells from perfused rabbit collecting ducts, which do not have primary cilia17; (2) the original experiments showing that cilium bending promotes a [Ca2+]i increase also demonstrate that the PLC blocker U73122 completely removed this [Ca2+]i increase1; this indicates that G-protein–coupled receptors may play a role in the flow response in MDCK cell; and (3) renal epithelia, like most other tissues, are known to be the source of many released paracrine factors, including extracellular nucleotides.7,8,10,18 It therefore seemed appropriate to investigate whether mechanical manipulation of intact renal tubules promotes release of nucleotides, which in turn activates epithelial P2 receptors. To address this, we chose the following strategy: Cells deplete of the major functional P2 receptor should not be able to respond to mechanically released nucleotides with a [Ca2+]i increase and therewith become a reporter of nucleotide release. Our previous studies in intact and cultured renal epithelia pointed to a significant role of the G-protein–coupled P2Y2 receptor.6,13,14 We therefore investigated functional P2 receptor expression in mouse mTAL. Using P2Y2 receptor KO mice, we found that the only P2 receptor expressed in the luminal membrane of mouse mTAL is the P2Y2 receptor. 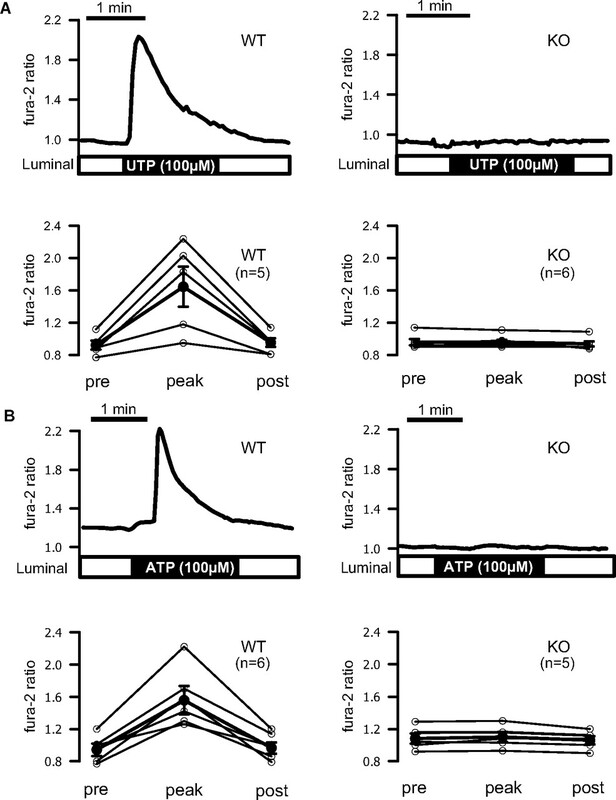 Luminal ATP and UTP promoted larger [Ca2+]i increases compared with the basolateral effect. The P2Y2 receptor is also present on the basolateral side of mTAL because basolateral UTP was not effective in P2Y2 KO tubules. The mTAL from KO mice responds to basolateral ATP with a sustained [Ca2+]i plateau, which was sensitive to extracellular Ca2+. This indicates another basolateral ATP-triggered P2 receptor. Some P2X receptors mediate sustained [Ca2+]i elevations; therefore, the residual effect in the P2Y2 KO mouse may be mediated by one of them.19 This issue was not pursued further. Subsequently, we investigated whether mouse mTAL tubules respond to an increase of flow with an elevation of [Ca2+]i. This was clearly the case, and tubular flow increases were found to be prominent activators of [Ca2+]i elevations in mTAL. The major finding of this study is that this flow response was greatly attenuated in tubules without the P2Y2 receptor. These results suggest that increased flow triggers the release of ATP. This hypothesis was substantiated by testing the flow response in the presence of basolateral or luminal apyrase, an enzyme established to scavenge extracellular ATP. Basolateral apyrase robustly inhibited the response. Also luminal apyrase effectively reduced the flow response but was less potent. These results strongly support that a flow stimulus triggers the release of nucleotides. Nucleotide release occurs on both sides of the epithelium, and basolateral ATP scavenging is more effective in inhibiting the flow-stimulated increase of [Ca2+]i. Finally, also the unspecific P2 receptor blocker suramin when applied to either side significantly inhibited the flow response. From these results, it is concluded that increasing tubular flow promotes a robust [Ca2+]i increase, which involves nucleotide release and auto- and paracrine activation of bilateral P2 receptors. The method to increase tubular flow involves the sudden elevation of the inflow pressure, which therefore must increase the tubular flow. We did not measure the tubular flow by collection of fluid. However, in each experiment, we quantified the degree of tubular distension, which inevitably occurs during this maneuver and is in part the consequence of the mechanical compliance of the tubule. The surrounding tissue in situ is likely to limit tubular distension. We observed an average of approximately 10 to 20% distension in very close similarity to values that were obtained with the same protocol in rabbit and mouse collecting duct15,17 or in animals in which in vivo imaging of distal tubular dimensions was quantified after the infusion of, for example, loop diuretics.20 It needs to be borne in mind that a complex mechanical stimulus is applied in our experiments. Increasing the pressure on the inflow side led to the acute, moderate distension of the tubule and at the same time increased the tubular flow. Throughout this article, we have used the term “flow response,” being aware that an equally suitable term could be “pressure or stretch response.” Our results need to be seen in contrast to those that were obtained in cultured cells that were grown on glass in an open chamber. In this “classical” system, an increase of inflow pressure does not cause distension of the epithelial layer but will primarily lead to increases of flow over the apical cell surface. This flow response is strictly dependent on the presence of luminal Ca2+ and shows a distinct time delay of approximately 35 s between the start of flow increase and the peak [Ca2+]i elevation.1 The response that we observed has a short time delay of a few seconds and is clearly inducible in the absence of bilateral Ca2+. These differences may suggest that the flow response in cultured cells reflects a different phenomenon to that described in the intact renal tubule. The role of the primary cilium as a flow-sensing organelle was mentioned at the beginning of this article. Our results do not address whether cilia are required for the observed flow response in mouse mTAL. Noteworthy, the flow response is reduced in perfused collecting ducts of a mouse model (orpk) with shortened primary cilia.15 In conjunction with our findings, this may suggest a link between the primary cilium and nucleotide release. It will need to be established whether bending of the primary cilium is a mechanical trigger to release ATP from renal epithelium. Our results strongly suggest that an increase of tubular flow produces tubular distension and an increase of [Ca2+]i in the intact nephron, which involves bilateral release of nucleotides from the renal epithelium and subsequent activation of luminal and basolateral P2 receptors. We speculate that the cilia-dependent flow response in cultured renal epithelia also involves a purinergic signaling component. Experiments were performed using 4- to 7-wk-old P2Y2 receptor WT and KO mice of either gender. Mice had free access to standard rodent diet and tap water. Mice were killed by decapitation. Both kidneys were removed and placed in ice-cold dissection solution (see Solutions and Chemicals) before slicing as described previously.26 Slices were transferred into a dissection chamber cooled to 4°C and gassed with 5% CO2/95% O2. mTAL were dissected in dissection solution from the inner stripe of the outer medulla using fine forceps. Kidney tubules were transferred to a perfusion chamber on an inverted microscope. Isolated tubules were perfused using a system of concentric glass pipettes as described previously.27 Care was taken to choose viable tubules by microscopic inspection and responsiveness to 5 mM basolateral Ca2+ at the end of each experiment. High extracellular Ca2+ stimulates the calcium-sensing receptor.28 Only tubules with a brisk [Ca2+]i elevation were included, and the response was similar in WT and KO tubules (data not shown). The set-up comprised an inverted microscope (Axiovert 100TV; Zeiss, Jena, Germany) with the objective C-Apochromat, 63×/1.2NA (Zeiss), a monochromator (Polychrome IV; Till Photonics, Planegg, Germany), and a CCD camera (MicroMax, 5 MHz; Princeton Instruments, Princeton, NJ). Image acquisition and data analysis were performed with Metamorph/Metafluor (Universal Imaging, West Chester, PA). Measurement of [Ca2+]i was performed with fura-2 or fluo-4. Tubules were incubated in 20 μM basolateral fura-2-AM or fluo-4-AM for 20 min at room temperature in control solution. In Ca2+-free conditions, fura-2 loading was performed without Ca2+ in the luminal perfusate. As a measure of [Ca2+]i with fura-2, the fluorescence emission ratio at 345 nm/380 nm excitation was used (acquisition frequency 0.5 Hz). The fluo-4 measured [Ca2+]i changes (excitation 488 nm, emission >510 nm) were expressed relative to baseline values. Cellular excitation light–induced damage29 was controlled by neutral density filters in the excitation light path and a three-fold binning. Fluorescence was recorded from the entire tubule (approximately 150 μm). During dye loading, the tubule was continuously perfused. The experiment was started 5 to 10 min after washout of extracellular dye. Freshly dissected mTAL were placed on cell-tak–coated (BD Biosciences, Erembodegem, Belgium) coverslips and washed in PBS. Tubules were fixed in 2.5% paraformaldehyde at room temperature. Tissue was washed and permeabilized with 0.3% Triton-X-100 PBS that contained BSA (15 g/L) for 15 min and incubated overnight with anti-acetylated tubulin (Sigma-Aldrich, Schnelldorf, Germany) at 4°C. After washing, sections were incubated with Alexa488-conjugated goat anti-mouse secondary antibody (Molecular Probes, Eugene, OR) in PBS supplemented with BSA and Triton X-100. The preparations were inspected with a c-Apochromat 63×/1.2NA objective on a confocal microscope (LSM 410; Zeiss). Experiments were performed at 37°C with the following control solution (in mM): 145 NaCl, 1 MgCl2, 1.3 Ca-gluconate, 5 d-glucose, 0.4 KH2PO4, 1.6 K2HPO4, and 5 HEPES. The Ca2+-free solution contained (in mM) 145 NaCl, 1 MgCl2, 5 d-glucose, 0.4 KH2PO4, 1.6 K2HPO4, 5 EGTA, and 5 HEPES. The dissection solution contained (in mM) 118 NaCl, 24 NaHCO3−, 1 MgCl2, 1.3 Ca-gluconate, 5 d-glucose, 0.4 KH2PO4, and 1.6 K2HPO4. Solutions were titrated with NaOH to pH 7.4 (37°C). Fura-2-AM and fluo-4-AM were obtained from Invitrogen (Taastrup, Denmark). All other chemicals were obtained from Sigma-Aldrich Denmark (Vallensbaek, Denmark) and Merck (Darmstadt, Germany). Agonist and antagonist solutions were prepared directly before the experiment. Data are shown as means ± SEM. For experimental series, the n reflects the number of tubules used. On average, two tubules were used from each mouse. Paired and unpaired t test were used to compare mean values within one experimental series. P < 0.05 was accepted to indicate statistical significance. M.E.J.J., E.O., and M.H.C. contributed equally to this work.